It was summer’s last hurrah today. We went for a local hike to assess fall colors. It was warm – too warm for our tastes. When we got home, I poured the coffee custard into the ice cream machine and watched as it became the creamiest and dreamiest ice cream I’ve ever made. I have to avoid caffeine in general because it gets me pretty hopped up and I’m hoppy enough to begin with. Jeremy can drink two pots of strong coffee and still appear to be on the verge of nodding off. We are opposites, but it makes life exciting. I started the ice cream the day before, but ran into a slight problem with the ice cream maker. I learned that 8 hours was not long enough to freeze the bowl thoroughly. After spinning for 30 minutes, I came back to a cooler coffee custard cream mixture, but it was still liquid. I stored the custard base in a tupperware in the fridge until I could get the bowl completely frozen after 24 hours and it worked. This is another one of David Lebovitz’ recipes from The Perfect Scoop and I think it’s the best one I’ve tried thus far. The smoothness of the ice cream is heavenly. It makes less than the peppermint recipe – the yield on this one is a quart. I split it into two pints when I scooped it out of the ice cream maker. One pint is plain coffee and the other pint is coffee chocolate chip because Jeremy couldn’t decide which he wanted to try. I am completely won over by the custard base. In fact, I wonder if that would have improved my first attempt with the peach ice cream? Will keep that in mind. This is a keeper as is the peppermint ice cream. It’s a great way to use up my odd egg yolks after making swiss meringue buttercream – and it will continue to fuel (Jeremy’s) science. 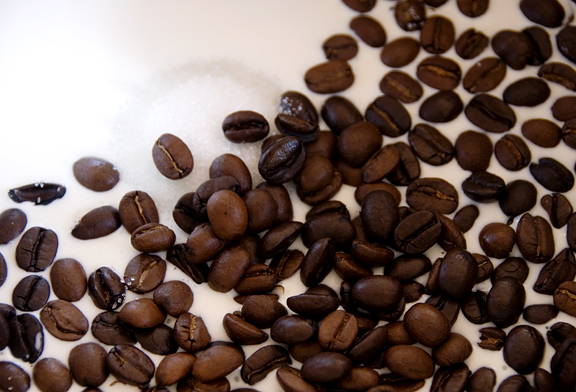 In a saucepan over medium heat, warm the milk, sugar, beans, salt, and 1/2 cup cream until steamy, but not boiling. Cover with a lid, remove from heat and steep for 1 hour at room temperature. Pour the remaining cup of cream into a medium bowl over ice. Set a strainer over the bowl. Reheat the milk mixture over medium heat until hot and steamy (but not boiling). In another bowl, whisk the egg yolks and slowly pour the heated milk mixture with the beans into the yolks while constantly whisking to avoid cooking the eggs. Pour the egg mixture back into the saucepan. Set the saucepan over medium heat and stir constantly, scraping the bottom and corners of the pot, until the mixture reaches nappe stage and coats the back of a spoon (about 10 minutes). 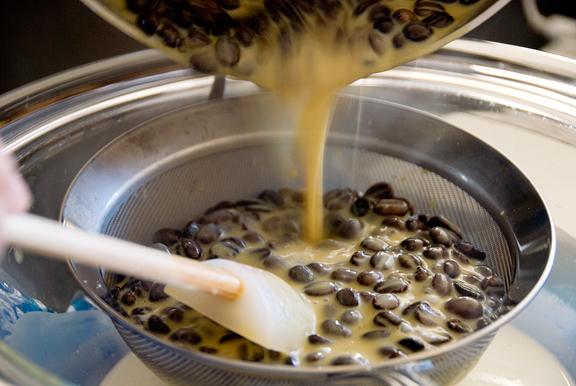 Pour the custard through the sieve and stir it into the cream, pressing the coffee beans to squeeze out as much liquid as you can. Discard the beans. Mix in the vanilla and stir until cool. 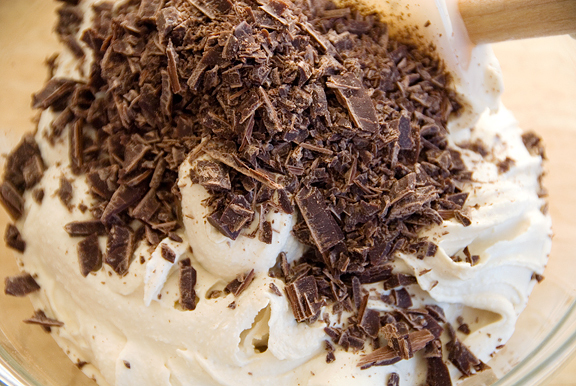 Chill the mixture thoroughly in the refrigerator then freeze according to your ice cream maker’s instructions. Stir in the chocolate and set in freezer to freeze. Thanks Sara. This one is a keeper of a recipe. Wow, this ice cream sounds and looks so good. I bought an ice-cream machine years ago but have never used it… perhaps it is now time for me to dig it out! Joe – I totally love this recipe and yes, it is like eating silk! Awesome. I attempted to make this tonight but had a questions..where you said “Pour the remaining cup of cream into a medium bowl over ice.” Did you mean to mix cream directly with ice, thus adding water to the finished product? I chose to just cool the cream in the freezer for a bit since I wasn’t sure. I didnt want to use that many beans, so I used a cup and smashed them up a little bit and let the mix hang out for more than an hour… I also am leaving the mix in the fridge until tomorrow–I’ve heard that makes for a richer flavor and more creamy texture. I’ll stop back here and let you know how it works. I stumbled upon your blog last week and this is the first of many many recipes I will try. They look awesome!! Keep up the good work! joey – sorry, you put the bowl on ice to cool the mixture down. glad you didn’t add ice! Really lovely!! I really love the taste of coffee beans! 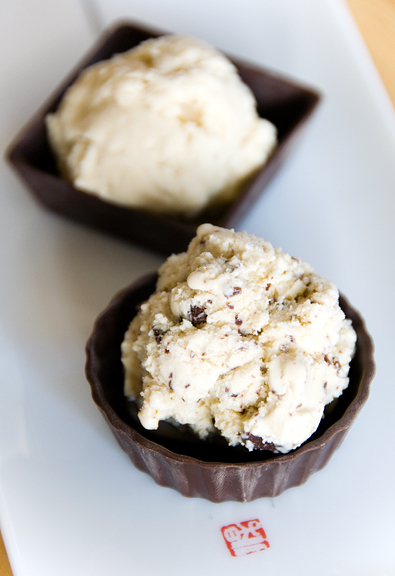 How much ice cream does this recipe yeild? 1 Quart? 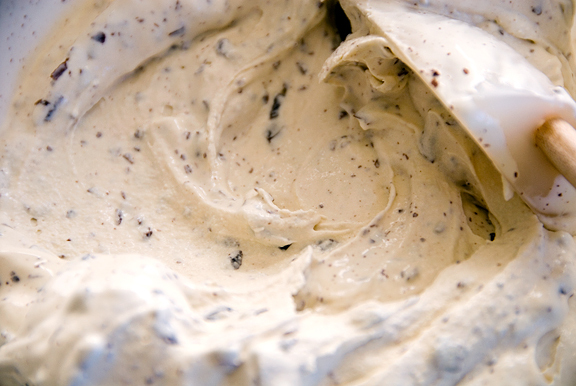 Did you add milk or cream to ice cream maker w/ the recipe or just make the recipe and then freeze? Heather – it is about 1 quart plus maybe 1/4 cup. At least that is what we usually get. I just make the recipe as listed above and pour the cooled custard into the ice cream maker. 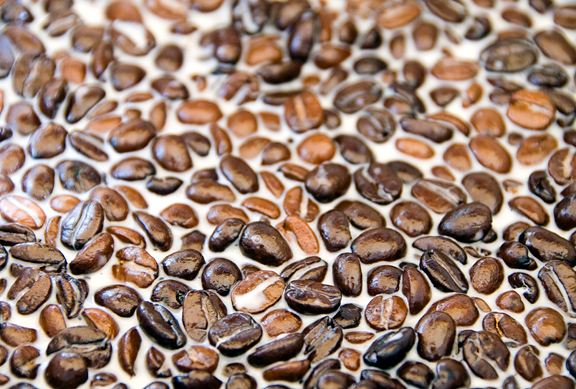 i think it would be fun to coat the coffee beans in melted chocolate after they have been removed from the ice cream and then put them on top or mix them in after the ice cream is done! This recipe is absolutely delicious! It’s the first recipe I made with my new ice cream maker! I used an organic dark roast coffee, so the coffee flavor was more pronounced than store-bought, and more delicious. I added 3 chopped heath bars to the ice cream, and my boyfriend and I absolutely love it! Thanks for another great recipe Jen!